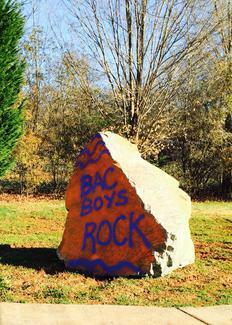 Do you want to reserve the BAC rock? The BAC rock is a yearlong fundraiser for the art department! There is a $5.00 (cash only) rental fee for each sign-up block that will be used for the art. Fees are nonreturnable and must be paid to Ms. Strohl to reserve your spot. The sign-up blocks are on a "first come, first serve" basis. Your message will remain intact for a few days until the next reservation date. We cannot make exceptions. Please supply your own spray paint. Use discretion when writing messages (Ex: Happy Birthday *Name,* Congratulations *Name! *) Anything inappropriate will be removed. I’d love it for October 6 through whenever, if possible. Just let me know!